De La Salle teams top Washington Massillon, Archbishop Moeller, Bishop Gorman for top spot. See the Lake Travis star and future Buckeye talk about his quest for greatness. The 2001 De La Salle Spartans are the greatest high school football team of all-time. There's a lot of compelling reasons why. Reason No. 1: The program has produced seven national championship teams. That shows long, sustained excellence. Reason No. 2: They are coached by arguably the greatest high school coach of all-time. Bob Ladouceur easily topped our list of the Top 50 greatest high school coaches and with a career record of 399-25, it's easy to see why. Reason No. 3: The number 151. That's how many consecutive wins the Spartans had from 1992 to 2003. Reason No. 4: The 2000 De La Salle Spartans were undefeated and the unanimous national champions. The 2002 Spartans were undefeated and the national champions. That means that the 2001 team was right in the middle of a three-year run that produced three undefeated teams and three unanimous national championship teams. That has only happened once in U.S. high school history. Reason No. 5: No. 1 vs. No. 2. In the first-ever battle between the top two teams in the country, De La Salle prevailed against an absurdly talented Long Beach Poly team, winning 29-15. Reason No. 6: Talent. At least three members of the Spartan team in 2001 went on to play in the NFL, including two-time All-Pro running back Maurice Jones Drew. For all of these reasons, the 2001 De La Salle team is the top football team in prep history. But what about the rest? MaxPreps has put together a formula to determine the top 50 greatest high school football teams of all-time. With teams needing an undefeated season and at least a Top 3 ranking in a national end-of-season poll in order to qualify, teams were awarded points based on their total wins, scoring average, points-against average, number of shutouts and margin of victory. We also looked at whether or not the team was part of a dynasty and how the players on the team did over a three-year span (as described above with the 2000, 2001 and 2002 Spartans). We also awarded points for All-State and noteworthy players on each team as well as the number of All-Americans. Points were also awarded for who coached the team, noting that coach's longevity and success. Strength of schedule was also a factor, particularly those schools that played out-of-state opponents during the regular season. The following is the results of those computations. It's no surprise that some of the great high school prep dynasties, like De La Salle, Valdosta (Ga.), Washington (Massillon, Ohio), Archbishop Moeller (Cincinnati) and St. Ignatius (Cleveland), are well-represented. It should be noted that teams were picked as objectively as possible. Previous lists here recognizing "teams of the decade" were chosen in a more subjective manner. Also, no two teams were chosen from back-to-back years. Instead, we tried to determine the best team during that span. Thus, there is no 2000 De La Salle or 2002 De La Salle team on the list. Nor is there a 2004 or 2006 Carroll (Southlake, Texas) or a 1997 Hampton (Va.) team. Top teams separated by more than one year were included, thus the 2001 and 2003 De La Salle teams are included. Finally, this exercise was not meant to imply that a great team from the World War I era could beat a team from the 21st century. Times are different. Weight training, desegregation, better coaching are among the many factors that give the 21st century teams the edge over the teams from 100 years ago. Instead, this list is meant to measure the greatness of a particular time during its era and then match it against teams from other eras. Notes: Season produced wins No. 114 to 125 of the Spartans' 151-game win streak ... This team was the second of four straight undefeated national championships making it the only school in the nation to ever accomplish that feat ... Played defending Southern Section champion Long Beach Poly in a battle of the No. 1 and No. 2 teams in the nation — the such meeting in U.S. prep football history ... Defeated the Jackrabbits 29-15 ... Team included future NFL players Matt Gutierrez at quarterback, Maurice Drew (later Jones-Drew) at running back and Derek Landri at offensive line ... Landri was named the state Player of the Year by Cal-Hi Sports ... Also defeated Mater Dei 34-6 in second game of the season. Notes: The fourth of four straight undefeated national championship teams for the Spartans ... Wins No. 139 to 151 in the 151-game win streak ... Defeated Pittsburg (Calif.) 39-0 for North Coast Section 4A championship ... Defeated Evangel Christian (Shreveport, La.) 27-10 in only out-of-state matchup ... Led by Oregon Duck recruits Terrance Kelly at linebacker, Cameron Colvin at wide receiver and Willie Glasper at defensive back ... Kelly was murdered two days before leaving to attend Oregon. Notes: The final team coached by Paul Brown before leaving for Ohio State ... Provided the only loss of the season for four teams — Cleveland Cathedral Latin, Weirton (W.Va.), Toledo Waite and Canton McKinley ... Won those four games by a combined score of 174-6 ... Scrimmaged Kent State and won 47-0 ... All 11 starters earned All-State honors by United Press ... Horace Gillom (RE) played for Brown with the Cleveland Browns ... Ran the single wing... "I seriously doubted whether my first team at Ohio State the following year could have beaten that team," Brown said ... Outgained opponents 4,538 yards to 647 ... Tom James and Gordon Appleby followed Brown to Ohio State ... State title was sixth straight for Washington under Brown and the fourth national championship ... Tigers also went 10-0 in 1939 and 1938 ... 1939 team also won national championship. Notes: Quarterback Tim Koegel was state offensive Player of the Year by the AP ... Offensive lineman Jim Brown was state Lineman of the Year ... A total of 39 Crusaders played college football including four at Notre Dame ... Bob Crable earned second team All-State honors at linebacker, but was two-time consensus All-American at Notre Dame and was No. 23 overall pick in 1982 NFL Draft. Played six years with New York Jets ... Crable coached eight seasons at Moeller (2000-2007) ... Moeller went 12-0 with a state championship in 1975, 1976 and 1977 and was also named national champion in 1977. Notes: Opened season in Texas with 44-14 win over two-time state champion Cedar Hill ... Beat eventual Florida 4A state champion Cocoa 46-10 ... Beat eventual California Open Division state champion St. John Bosco 35-20 ... Beat Hawaii Open Division runner-up Kahuku 35-7 ... Beat Florida Class 7A state champion St. Thomas Aquinas 25-24 in three overtimes ... Beat Nevada opponents by an average score of 60.9 to 5.5 ... Beat Liberty in state finals 84-8 ... Quarterback Tate Martell was named Gatorade National Player of the Year and MaxPreps National Player of the Year ... Haskell Garrett (DE) and Bubba Bolden (DB) were both All-Americans ... Biagio Ali Walsh, grandson of Muhammad Ali, was team's leading scorer and rusher with 1,462 yards and 134 points. Notes: Final Moeller team coached by Faust before he left for Notre Dame ... Downed Washington (Massillon) 30-7 for fifth state titles in six seasons ... Running back Mark Brooks was named state back of the year by Associated Press while Doug Williams was named state lineman of the year. Notes: Faced an extremely tough Trinity League schedule that included a 31-21 win over St. John Bosco, a 51-21 win over Orange Lutheran and a 51-7 win over Servite ... Knocked off Bishop Gorman 35-21 and Bergen Catholic 62-14 ... Concluded the season with a 52-21 win over De La Salle in the Open Division state finals ... Led by junior quarterback J.T. Daniels, who was the national Player of the Year by Gatorade and finished his career with 12,014 yards and 152 touchdowns. He skipped his senior year and became a true freshman starter at Southern California. Notes: The state title was Joseph's fourth since taking over at Katy in 2004 ... Katy has nine undefeated regular seasons under Joseph and three 16-0 seasons ... The 62 points allowed is the best defensive performance by a Katy team in the school's 75-year history ... Dominated the postseason by outscoring opponents 309-44 in six games ... Had a 77-0 playoff win over Westside (Houston) and a 66-0 win over Friendswood ... Beat Lake Travis (Austin) 34-7 in the finals. Notes: The first of two national championship teams for the Crabbers who were also No. 1 in 1997 ... Head coach Smith is the third all-time winningest coach in U.S. history with 484 wins entering the 2018 season ... Nine games of 50 or more points ... Led by two-time All-American Ronald Curry, who had 11,519 yards of total offense in his career with 8,212 yards passing ... Curry led Hampton to three straight state championships in football and one in basketball in 1988 ... He played football and basketball in college at North Carolina and played wide receiver in the NFL for several teams. Notes: Quarterback Kerwin Price played running back as a junior but earned All-American honors after the position change his senior year ... Bryan Cox played tight end and defensive line before playing at Southern Illinois and eventually in the NFL ... Scored at least 33 points in all but one game ... Had a high of 76-0 in a win over Collinsville ... Defeated Chicago Brother Rice 46-0 in the state championship game. Notes: All-American running back Billy Hicks rushed for 42 touchdowns and 34 PATs for 286 points ... Offense gained 8,588 yards of offense, which ranked as a national record for 73 years ... Defeated Jackson (Tenn.) 89-0 for biggest win ... Defeated Dayton Stivers 61-0 in national championship game .0.. Five Zebras made first team All-State with three more making second team ... Center Frank McGibbony was named captain of the All-State team. Notes: Coach Paul Tyson led Waco to four state titles and was 167-30-9 between 1921 and 1941 ... Defeated Houston Jefferson Davis 124-0 in first round of playoffs ... Topped Abilene 21-14 for state championship ... Beat Cleveland Cathedral Latin 44-12 for national championship ... Also beat Marlin 107-0 and Georgetown 93-0 ... According to Dallas SportsDay, Knute Rockne of Notre Dame consulted Tyson on offensive philosophy ... Developed the "spinner" move in 1927, which resulted in 784 points. Notes: Beat three undefeated teams en route to the Class 5A-Div. 2 state championship, beating Plano 37-27 in the quarterfinals, Lufkin 46-28 in semifinals and Katy 34-20 in the championship game ... The middle of three straight national championships for coach Dodge ... Quarterback Greg McElroy threw for 4,636 yards and 56 touchdowns and played at Alabama ... Running back Tre' Newton, son of former Dallas Cowboy Nate Newton, rushed for 1,345 yards. Notes: Abilene won three straight state championships under Moser and posted a 49-game win streak ... Glynn Gregory was a two-time All-State player and an All-American at running back. He went on to play defensive back for the Dallas Cowboys ... Named the Texas "Team of the Century" by the Dallas Morning News in 1999. Notes: Perhaps the best St. Ignatius team ever, the 1993 squad had 13 players earn postseason honors including Mike Buzin, who was the Associated Press state Player of the Year and quarterback Scott Mutryn, who earned Parade All-American ... Defeated Archbishop Moeller 38-20 in the Division I state championship game. Notes: Defense featured a sophomore All-American in future NFL safety Jabril Peppers ... Defeated teams from three other states, including 35-7 over Mission Viejo (Calif.), 22-16 over Manatee (Fla.) and 38-7 over St. Edward. Don Bosco Prep's 2011 team is the 16th best team of all time. Notes: The last national championship for the Crusaders and the only one not coached by Gerry Faust ... Led by Parade All-American Hiawatha Francisco, who rushed for 1,460 yards and 14 touchdowns ... A total of 11 players went on to FBS colleges ... Beat Washington (Massillon) 35-14 in the state finals. Notes: The first national championship team for Bazemore ... Season was part of a 37-game win streak and three straight state championships ... Defeated five teams that were ranked during the season including No. 1 Waycross 48-13 ... Led by state lineman of the year Bill Schroer. Notes: Played Mater Dei, a national champion in 1994 and 1996 for the first time for a 28-21 win ... Wins No. 66 to 78 in the 151-game win streak ... Linebacker D.J. Williams earned first team All-State honors by Cal-Hi Sports and went on to play for the Denver Broncos ... Running back Atari Callen also earned All-State honors ... Defeated Castro Valley 55-13 in North Coast Section Class 4A finals. Notes: Defeated four-time defending national championship Oak Park (Ill.) 80-0 in the national championship game ... Running back Jack Cannell scored 38 touchdowns and threw 16 touchdown passes ... Rufus Bond added 22 touchdowns ... Coach Cleo O'Donnell was 68-8-6 in 15 years between 1901-1915. Notes: The middle of three straight undefeated state championship teams ... Offensive line included future NFL players Michael and Maurkice Pouncey ... Total of 19 players went on to play in college ... Defeated St. Thomas Aquinas 39-10 for state championship. Notes: The 701 points is the most points scored for a team that did not give up a point on defense in U.S. history ... Seven games with over 60 points including 67-0 over Commonwealth A.C., 63-0 over Bethlehem Prep, 70-0 over Steelton, 73-0 over Wilkes-Barre, 79-0 over Naval Prep of Washington D.C., 89-0 over Baltimore Polytechnic, 93-0 over Chester ... Defeated Portland (Maine) 56-0 in national championship game ... Coach Smith was 56-7 in seven seasons at Tech ... Halfback Carl Beck ran for 34 touchdowns and scored 204 points, 445 points for his career. He later played at West Virginia and Vermont in college and Pottsville and Frankford in the NFL ... Tackle Hap Frank went on to play in the Rose Bowl for Penn State ... The 1918 Tech team went 9-0 and was named national champions as well ... Tech closed its doors in 1925-26 ... Information from Hal Wilson. Notes: Rushing attack did not have a 1,000-yard rusher, but gained over 3,500 yards rushing on the season ... Coach Curtis is the second all-time winningest coach in U.S. history with 569 wins entering the 2018 season ... Duke Riley earned All-American honors. Notes: Known simply as "Oak Park" in the early part of the 20th century ... The best of four straight national championship teams for Oak Park, the second of three coached by Zuppke before he moved on to coach at Illinois ... Defeated Everett (Mass.) 32-14 for national championship ... Defeated Evanston Academy 101-0 ... Had nine shutouts during the season... Defeated Chicago powerhouses Hyde Park 59-0 and Englewood 61-0 ... Led by future college All-American Bart Macomber. Notes: Ironically, this is the one state championship team that longtime coach Tommy Knotts didn't coach, as he stepped down for a year to be an assistant at Duke. Geiller filled in for the one season ... Part of a 109-game win streak, the second longest in national history ... Passing attack featured All-Americans Joe Cox and Mohamed Massaquoi ... Cox threw for 4,509 yards and 66 touchdowns and was named the North Carolina Gatorade state Player of the Year. Notes: The first of Curry's three national championship teams ... led by quarterback Joe "Bo" Orlando, who played at West Virginia and in the NFL ... Offense rushed for 3,645 yards and gave up only 710 yards rushing ... Dominated the playoffs, outscoring opponents 116-0 including 41-0 over North Pocono in the state finals. Notes: Named the best team in the 100 years of Florida football by the FHSAA ... The second of four national championships for coach Kotys ... Led by Craig Curry, who was one of the first black quarterbacks to start for an integrated school in Florida ... Running back Gerald Tinker won an Olympic gold medal as a member of the United States relay team in 1972... Paul Johnstone earned All-American honors ... Had seven straight shutouts, nine overall. Notes: Featured one of the school's best all-time air attacks with All-State quarterback Stan Bounds and record-setting wide receiver Stanford Rome (1,573 receiving yards) ... Steve Stanaland was the state Lineman of the Year ... Defeated two teams ranked No. 2 in the state, including Warner Robins 35-6 and Avondale 62-12. Notes: Central won the national championship during the same year that it was famously desegregated ... All-Americans included Bruce Fullerton and Billy Hicks ... Nine players earned All-State honors ... Coach Matthews coached 11 seasons at Central, winning 10 state titles while going 109-17-3 ... Defeated teams from Tennessee, Texas, Louisiana and Kentucky. Notes: Team featured a pair of future NFL running backs in Giovanni Bernard and James White ... Top receiver was Duron Carter, son of NFL Hall of Famer Chris Carter ... Defeated Lakeland 56-7 in Class 5A state championship game ... Beat Elder (Cincinnati) 35-24 in season opener. 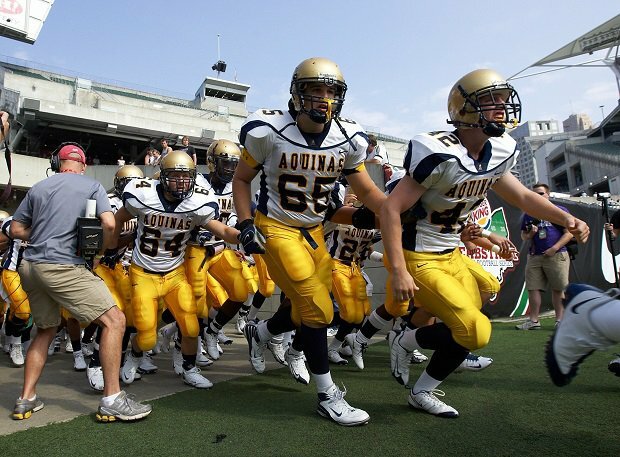 St. Thomas Aquinas' 2008 team lands at No. 30 on the list of the 50 greatest high school football teams. Notes: Mather coached six years at Washington and coached a state championship team each year ... The 1950 team was the first of three national championship teams for Mather ... He had a 57-3 record at Washington ... Bob Howe scored 14 touchdowns to lead the offense and was named first team All-Ohio ... Beat No. 8-ranked Canton McKinley and No. 9-ranked Steubenville ... Guard Jim Reichenbach was first team All-State and became an All-American at Ohio State. Notes: Under first-year coach Rolle, Northwestern won its second straight state championship and posted its second straight 15-0 season ... Hosted three-time National champion Carroll (Southlake, Texas) and won 29-21 ... Beat Boone 41-0 for the state championship ... Quarterback Jacory Harris threw for 3,445 yards and 49 touchdowns. Notes: Edged Allen (Texas) and St. John Bosco (Bellflower, Calif.) for No. 1 ranking by three different ranking services ... Opened the season with an impressive 55-0 demolition of Norcross (Ga.) ... Also beat Bishop Gorman 28-12 in midseason ... Topped Bolles 40-21 for state championship ... Team led by Treon Harris, the coach's son, who threw for over 2,000 yards. Notes: The second of George Smith's two national championship teams ... Quarterback Jacob Rudock threw for 2,827 yards and 36 touchdowns with future NFL receiver Phillip Dorsett catching 46 passes for 907 yards ... Traveled to Texas and beat Skyline 31-3 in the season opener ... Also beat Camden County (Ga.) 42-28 ... Beat Plant 29-7 for state title. Notes: Led by Parade and Gatorade National Player of the Year Ron Powlus, who threw for 2,885 yards and 31 touchdowns ... Topped Blackhawk 33-6 for the state Class AAA championship ... The second of three national championships for Curry. Notes: Knocked off preseason No. 1 LaGrange 16-6 in the season opener ... Blanked Clarke Central 28-0 in the state championship game ... Led by Greg Talley, who was the state offensive Player of the Year and went on to play at Georgia ... Won the first 12 games of 1987 for a 27-game win streak. Notes: Second of Brown's state championship and national championship teams ... The 1935 team also went 10-0 and won national and state championships ... Handed New Castle first loss at home in three seasons ... Defeated Canton McKinley 21-0 for its only loss of the season ... Finished season with a 20-game win streak ... Allowed only 14 points with eight shutouts ... Halfback Bob Glass was three-time All-State player, played at Tulane, drafted by New York Giants, died in South Pacific during WWII. Notes: The first of coach Bob Ladouceur's seven national championship teams ... Wins No. 27 through 39 in the 151-game win streak ... Defeated James Logan 35-0 in North Coast Section championship team ... Linebacker Nate Geldermann and quarterback Mike Bastianelli earned All-State honors by Cal-Hi Sports. Notes: Led by quarterback Stony Case, who threw for 2,029 yards and 28 touchdowns, and running back Chris Comer, who rushed for 1,589 yards and 22 touchdowns ... The state championship game appearance was the ninth in school history — a state record ... Defeated Aldine, which would earn national championship honors in 1990, 28-14 in the state championship game. Notes: The Black Bears opened the season with an 87-7 win over Lamar County and an 82-0 win over Jones Valley ... Played Senn High from Illinois for national championship and won 42-0... John Henry Suther was the top player, earning All-Southern by the Orlando Sentinel ... Tuscaloosa was 8-0-1 in 1925 in Burnum's first season and 9-0 in 1927, 1928, 1929, and 1930 and 8-0-2 in 1931 ... Consolidated after 1978 season with Druid to become Central ... Went 64 straight games without a loss. Notes: Third of Mather's three national championship teams ... Mather left Washington to coach at Kansas ... Jim Letcavits was All-Ohio and joined Mather a Kansas where he was All-Big Eight ... Five Tigers earned All-State honors ... Defeated Warren Harding, ranked No. 5 in the state, and Fremont Ross, ranked No. 6 ... Handed Canton McKinley worst loss ever in the series between the two teams, winning 48-7. Notes: The state championship was the 21st state title in school history. Trinity has since won four more state crowns for a state best 25 all-time state championships ... Travis Wright led the offense with 2,570 yards passing, while Dalyn Dawkins rushed for 1,750 yards and James Quick caught 69 passes for 1,206 yards ... Finished No. 2 in the nation by Don Bosco Prep ... Defeated teams from four different states including Brentwood Academy and Montgomery Bell Academy from Tennessee, Elder, St. Xavier and Archbishop Moeller from Ohio and Cathedral from Indiana ... Defeated Scott County 62-21 in state finals. Notes: The fifth of five straight state championships by St. Ignatius, which went 67-3 from 1991-94 ... Defeated Brunswick 41-21 in the Division I state championship game ... During the regular season beat Canton McKinley 13-0, St. Edward 27-10 and Archbishop Moeller 24-12. Notes: Edged out East St. Louis and T.C. Williams (of "Remember the Titans" fame) for the No. 1 spot in two polls ... Defeated No. 2 Clarke Central 21-14 in state championship game ... Had four All-State players, including state defensive Player of the Year John Porter at linebacker ... First national championship team for coach Hyder. Notes: Posted a 65-35 win over Colquitt County and a 39-2 win over Memphis University ... Beat Meridian 28-7 for state championship ... The 2010 season came during a stretch when South Panola went 117-2 ... Running back Qyendairs Griffin rushed for 2,670 yards and 37 touchdowns. Notes: Coach Kyle's first national championship team and second of his 11 state titles ... All-state quarterback Joe Pickens led the offense, throwing for 2,240 yards ... Defeated Archbishop Moeller 34-28 in the state championship game ... Also knocked off Washington (Massillon) 42-21 in the semifinals. Notes: Ranked No. 1 in the nation three years in a row from 2012-14 by High School Football America ... Blasted Pearland 63-28 in the Class 5A state finals ... Opened the season with a 49-27 win over Carroll (Southlake) ... Defeated eventual Class 5A Div. 2 champion Cedar Hill 39-20 in the second game of the season ... MaxPreps National Player of the Year Kyler Murray led the offense, throwing for 3,669 yards and 46 touchdowns and rushing for 1,328 yards and 18 touchdowns. Notes: Finished No. 3 by every ranking service behind Booker T. Washington and Allen ... Beat Centennial (Corona) 70-49 in the California Open Division Southern California regional game ... Topped De La Salle 20-14 in the Open Division state final ... Beat Mater Dei 34-7 in the Southern Section Division 1 final ... Future NFL quarterback Josh Rosen threw for 3,200 yards and 39 touchdowns ... Sean McGrew, a sophomore, led the rushing attack with 2,076 yards ... Lineman Daniel Mama was the team's most decorated player, earning Los Angeles Times Lineman of the Year honors and MaxPreps All-American honors. Notes: Team featured one of the greatest backfields in high school history with future Heisman Trophy winner Terry Baker at quarterback, future NFL Hall of Famer Mel Renfro at running back and state sprint champion Ray Renfro, Mel's brother, at running back ... Ray Renfro led team in scoring with a state record 24 touchdowns ... Portland Jefferson was also ranked No. 1 in 1957, sharing the award with Little Rock Central. Notes: Reagan opened in 1965 and quickly became one of the top teams in Texas, winning three state titles (1967, 1968 and 1970) in its first six seasons ... The 1968 team beat Odessa Permian 17-11 for the Class 4A state title ... A total of 15 players earned college scholarships ... Running back Donald Ealy led rushing attack with 1,252 yards ... Program won 35 games in a row and were ranked No. 1 in the nation in 1967 and 1970. Note: Information for the notes came from team websites, jimmychitwood.com, Tim Hudak's research on national champions, state association websites, and Georgia High School Football Historians website. 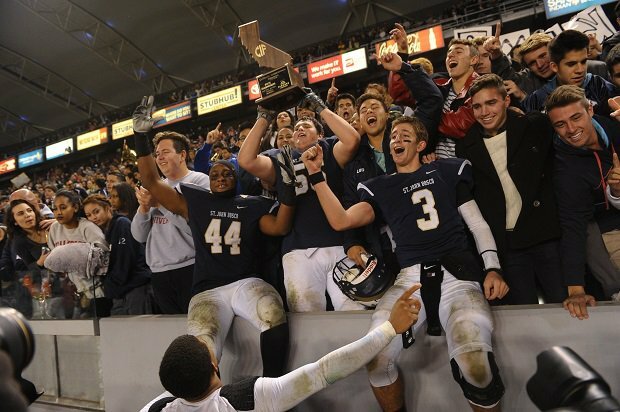 St. John Bosco celebrates its 2013 state title win and lands at No. 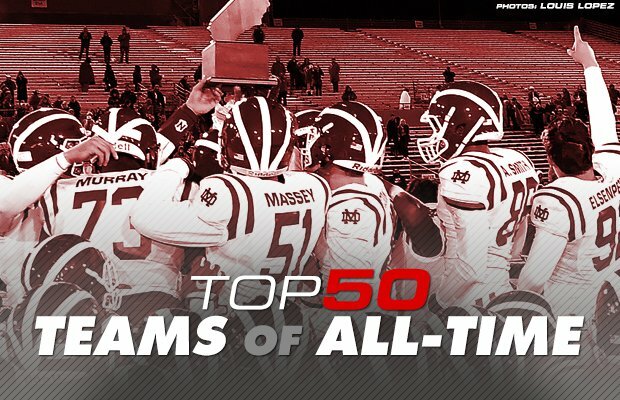 48 on the list of the 50 greatest high school football teams of all time.